For Gen 2 Sub 2000 either caliber, will not fit Gen 1 Sub 2000. 1. Make sure that magazine is removed and firearm is unloaded. Please be sure to follow all safety procedures when handling firearms. 2. Remove factory front sight by following the instructions provided by Kel-Tec via their Sub2000 Gen2 Safety, Instruction, and Parts Manual. See Kel-Tec’s website for PDF download if you don’t have the Sub2000 Gen2 Safety, Instruction, and Parts Manual. 3. 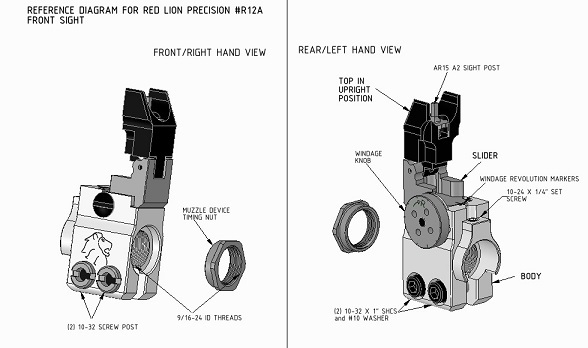 Make sure muzzle threads are clean and set screw is not protruding into ID of #R12 Front Sight. Screw the #R12 Front Sight onto the 9/16-24 threads with end with set screw toward the receiver until it bottoms out. Back off just enough to achieve approximate proper position radially (will be less than one revolution). 4. Tighten down both 10-32 screws using a 5/32” allen wrench and a large flat head screw driver in the screw post slot so that the front sight is snug but can still be positioned radially by hand. Once positioned correctly radially, tighten both 10-32 screws to 5-6 ft/lbs. 5. Flip top of sight up if not already done so for allen wrench access and then snug down 10-24 set screw using a 3/32” allen wrench. 6. Installing Timing Nut.-Care should be taken to keep supplied wrench on hex of Timing Nut. -If a muzzle device is not being used, just finger tighten Timing Nut against front sight with hex flange facing toward muzzle and reinstall factory thread protector that was removed previously. Timing nut can be held with supplied 11/16” wrench while tightening thread protector. 7. Installation should now be complete. To adjust windage place the sight tool (included) in the 4 holes on the face of the windage knob or use a dime on the opposite side in windage screw head. Windage knob is marked for bullet impact adjustment direction. Elevation is a standard AR15 A2 sight post, place sight tool in the 4 half moons of the sight post and depress the detent to turn the post. Turn clockwise to raise bullet impact and counter clockwise to lower bullet impact. Each windage click is .67” @ 100 yards. Each elevation click is 1.72” @ 100 yards. The R12 is a replacement flip-up front sight for the Gen 2 Sub 2000 that features AR15 A2 style click adjustments for elevation and windage.